Monitor features a 3.2" screen and a digital camera to provide crystal clear image. 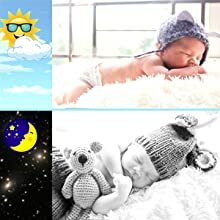 The camera automatically detects low light and enables night vision so you'll be able to see your baby even after bedtime. Two-way communication lets you soothe your child without entering the room, while the room temperature display helps you ensure that your baby is comfortable. Sound level LED indicator allows you to see how much noise your baby is making in case he/she is crying. 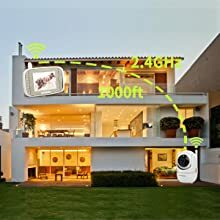 No need to walk into your baby's room to adjust the camera, you'll see the whole room clearly, day or night, with remote pan, tilt, and zoom. 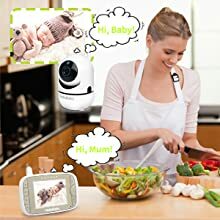 Audio only mode, turn the video baby monitor to audio baby monitor if you donâ€™t want to be disturbed by the video, Battery consumption reduce by 50%. Simply short press the power button to turn on audio only mode, you could press any key to turn on the display when you want to check your baby. 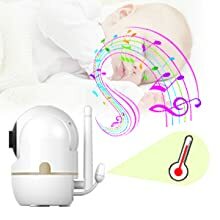 A row of sound level LED indicator on parent unit allows you to see the sound of your baby voice alerting you if he/she is crying out when you have the volume turned down. The automatic light sensor precisely detects the light conditions and automatically shifts between day and night modes. Visibility up to 15 feet in complete darkness extends your vision at night; never miss a moment, day or night. 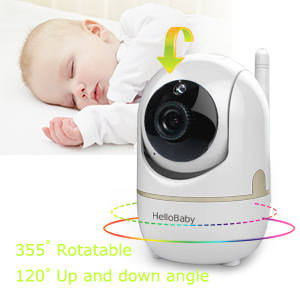 The camera is equipped with a temperature sensor, allows you know your baby is comfortable and safe. Soothe your baby by playing lullabies remotely as if you were in the same room with your little one. The crystal clear two-way audio feature allows conversation both ends as clear as if you were in the same room with your little one. Application of frequency hopping and digital encryption technology ensures secure and reliable connection. The portable parent unit can move around with you, enabling you to hear, see and talk to your baby no matter where you are in the house. So far this monitor has been working great for us! Night vision works well, it is in color when not in night vision though we rarely use the camera during the day. The range is good and works inside and outside our house. The battery is okay, probably lasts 4-5 hours not plugged in, but again we mostly use it at night so that hasnâ€™t been an issue. I love the tilt, pan, and zoom feature. The monitor picks up faint noises well, there is a slight white noise that comes from the monitor itself though it doesnâ€™t bother me any (I can barely hear it). I had some questions for the company and customer service has been excellent. Overall, I would give this product a 5 star rating and definitely would recommend it. Note: this is for the HB65 model with the remote zoom pan and tilt. Bought this as a gift for my nephew. They love it! So far so good on battery life. Seems to work great in all light. I purchased this monitor for my daughter and her baby. She is pleased with the monitor. I had already used this model because my daughter in-law uses it for her baby so I felt confident purchasing the same product. Light weight. Perfect for travel. Dear Baby Monitors, Thank you very much for generously donating $300.00to The Rio Tinto Ride to Conquer Cancer® benefiting Queensland Institute of Medical Research. Love the product, quick delivery. Thanks BMD!